Imagine stepping through a seemingly ordinary door into a world where art, mystery, music and technology unite. Where there’s no limit to the imagination, and you can play as freely as you did as a child playing dinosaurs in the back yard. Meow Wolf provides all this and more, and is coming from Santa Fe right here to Denver in 2020! Ready to travel to another dimension? Read on to learn what to expect at Meow Wolf Denver, and why you should visit the original in the meantime. Meow Wolf is an immersive arts and music experience that has remained unparalleled since its first building opened in 2015. It started out as a Santa Fe artist collective, displaying and supporting artists from all mediums including video production, sculpture, and music. In 2015, Game of Thrones creator and Santa Fe local George R.R. Martin purchased an abandoned bowling alley for $750,000 to lease to the Meow Wolf Collective. From here, The House of Eternal Return was born, giving Meow Wolf global acclaim. The House of Eternal Return is Meow Wolf’s permanent interactive art installation that is built inside an actual Victorian home. Once you set foot in the house, you step into an alternate reality. In this reality, you’re solving a very odd mystery while exploring parallel worlds that seem to defy laws of space and time. Each room and world is created or curated by an artist from the Meow Wolf collective. In its first year alone, Meow Wolf and The House of Eternal Return attracted over 400,000 visitors from around the country. 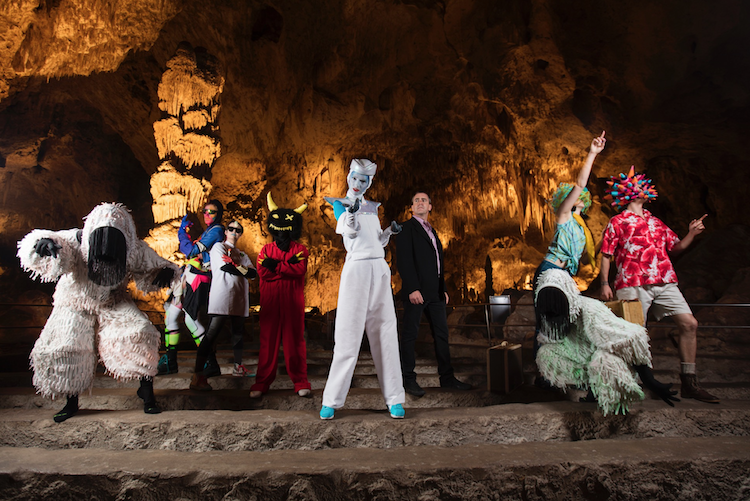 The Meow Wolf Team was sure to share their success with other arts programs around the country by donating over half a million dollars in 2017 alone. Now that word continues to spread they’re prepared to bring new experiences to the rest of the world, starting right here in Denver, Colorado. Projected to open in 2020, Meow Wolf has big plans for their Denver venue/installation. At 90,000 square feet, Meow Wolf Denver will be 3 times the size of the House of Eternal Return. The new space will be nestled between the Pepsi Center and Mile High Stadium and hold the work of 150-300 Denver artists and craftsmen. Every inch will be dedicated to an immersive new installation. In fact, design director Anthony Guida says the experience will even lead participants below the viaducts. A 200year lease has been signed and tickets are available now to help complete funding. For the full VIP experience, you can purchase tickets to the opening day gala for $1000, or guarantee your spot forever with a lifetime pass for $10,000. The magic won’t stop in Colorado! More Meow Wolf locations are coming, including one in 2019 in Las Vegas and another to follow in Austin, Texas. If 2 years feels like too long to wait to teleport to other worlds and witness some of the country’s best modern artists and musicians, start the adventure now at the birthplace of Meow Wolf in beautiful Santa Fe, New Mexico. Not only will you get to unravel an intricate mystery inside the House of Eternal Return, but you can choose from an array of eclectic concerts to attend. The experience doesn’t have to stop at Meow Wolf. Santa Fe has no shortage of delectable delights to enjoy on your trip. From its historic landmarks to delicious options for Southwestern food to uniquely luxurious adobe lodgings, Santa Fe offers an experience for all your senses. Indulge in critically acclaimed New American eats in the elegant and nostalgic setting of an authentic adobe home, circa 1756. Don’t forget to try out a bottle of their carefully chosen wine while you’re at it. The Shed was listed as one of USA Today’s 10 Best Authentic Tex-Mex restaurants in Santa Fe for a reason. It’s located in a historical home that boasts multiple beautifully decorated rooms to dine in. Don’t leave without trying the green chili, which is hand ground every day! This beautiful national monument is a haven for geology and archaeology fans. It’s comprised of cone shaped tent rock formations that were formed 6 to 7 million years ago after a volcanic explosion. Leave your pups behind for this one, as they’re not allowed. Originally created in the early 17th century as Spain’s government building, the Palace of Governors still stands today. It serves as New Mexico’s history museum, showcasing the rich culture the state was born from. This small church was founded in 1816 by residents of the village of El Portero, and later purchased by the Spanish Colonial Arts Society in 1929, to be donated to the Roman Catholic Archdiocese of Santa Fe. Each year more than 300,000 visitors come to experience the legendary healing powers of the dirt inside the church. This stunning resort and spa is one you’re guaranteed to recommend to friends. With 4 different in-house dining options, a spa and a full fitness center, your self-care ritual will not be lacking. If you’re traveling with a group or family, try the comfort of an Anasazi suite. Each suite has 1-2 bedroom options, a full living and dining space with a personal fireplace, and the most comfortable of amenities like Pendleton bedding. With extremely accessible private airports in Santa Fe including the Jet Center at Santa Fe and Signature Flight Support, a private flight is guaranteed to be not only your most comfortable and stress-free way to get to Santa Fe, but the most convenient as well.